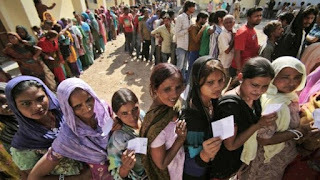 Conducted by the Election Commission of India (ECI), world’s most powerful electoral institution, the unique experience for the human race will unveil the winner on 23 May counting day who would rule the one billion-plus nation for next five years. After completion of its term in office, the ruling National Democratic Alliance (NDA) led by Bhartiya Janata Party (BJP) is seeking fresh mandate from the electorate. The NDA nominees in the polls are primarily facing candidates belonged to the opposition Congress led United Progressive Alliance (UPA). The third front, a loose coalition of some regional political parties across the country, named Maha Gatbandhan, is also expected to put challenges to both NDA and UPA candidates in selective Parliamentary constituencies. In the last general elections, projected Prime Ministerial candidate Narendra Modi did almost a magic that helped the nationalist party to win absolute majority with 282 seats in the Lok Sabha (LS). NDA’s total tally increased up to 336 (out of the 545, where two members are nominated) in the 2014 national polls. On the other hand, the oldest party (Congress) shrank to 44 seats in the house of people’s representatives. The region, surrounded by Nepal, Bhutan, Tibet (China), Myanmar and Bangladesh, sends 25 members to the LS , but this time BJP leadership has taken the share very seriously. BJP president Amit Shah claims that his saffron party along with allies will win over 20 seats from the region. The Congress has not made any claim but maintained their candidates will do fairly well in the forthcoming polls. Prime Minister Modi, the star poll-campaigner of BJP, keeps seeking votes for his developmental activities along with non-corrupt governance and security to the nation. Besides pledging for more roads, airports, and other infrastructures, he promised more jobs for the youths. At the same time, Modi maintained that they would continue various welfare programs like providing toilets, houses, cooking gas, crop insurance, loans for small businesses and also electricity connections. On the other hand, the leadership of Congress party that ruled the populous south Asian country for over five decades since 1947 promised to make India a poverty free nation by 2030 with provisions of minimum income guarantee scheme, waving of peasant’s bank loan and creation of sustainable jobs. He continues targeting PM Modi for failure in various aspects including in realizing the saffron leader’s earlier promise to create 10 million jobs every year for Indian nationals. The young party president Rahul Gandhi has drawn attentions from the citizens with his promise that if voted to power they would provide a minimum guaranteed income of Indian rupees 72,000 per year to every poor family. Asian Human Rights Commission also issued as a statement praising Gandhi for his proposed initiative that would enhance the international mission for sustainable development goals by 2030. In eastern region, the Congress is expecting electoral benefits out of the ruling party’s much debated citizenship amendment bill (CAB), which sparked massive reactions among northeastern ethnic groups. Most of the people in northeast India opposed the saffron plan to welcome persecuted religious asylum seekers from Bangladesh, Pakistan and Afghanistan, who had already entered the country before 31 December 2014. CAB was successfully passed in the LS on 8 January and was soon scheduled for Rajya Sabha, the upper house of Indian Parliament so that it could be sent to the President of India for necessary endorsements. But it was not pushed forward by the Union (federal) government as the ruling party had no majority in the Council of States. Thus the initiative to amend the law was lapsed with an embarrassment to the Hindu nationalist party. Need not to mention that any major elections in northeast India was synonymous to violence perpetrated by insurgents, who had been fighting the Centre (New Delhi) for decades demanding self-rule to sovereignty. The separatist militant outfits even earlier dictated the people to avoid the electoral process as they asserted it as being a symbol of suppression by the colonial Indian forces. But the northeastern electorate valiantly defied their diktat. Influential and dreaded armed groups like United Liberation Front of Assam (Ulfa) made it a habit to issue press statements threatening the electorate of dire consequences if they prefer to cast their votes and later the same militants secretly supported poll-candidates of their choices. This time two Manipur based insurgent groups namely Zomi Re-unification Organization and Kuki National Organization came out with covert supports to saffron candidates. We, the undersigned feminist groups and individuals strongly condemn the sexual harassment and brutal murder of 13 year old Rajalakshmi who was beheaded on October 22 by her neighbour Dinesh Kumar, an older man belonging to an upper caste The dastardly act took place in a village on the outskirts of Salem, near Aathur, fourteen kilometres away from Thalavaipatti. Rajalakshmi was studying in Class 8 in a nearby government school. She had reportedly told her mother about Dinesh’s continuous sexual advances, which she repeatedly turned down. That fateful night, she and her mother, Chinnaponnu were alone at home when the crime took place. Her father, a daily wage labourer works in a graveyard because of which he often stayed away from home at night. 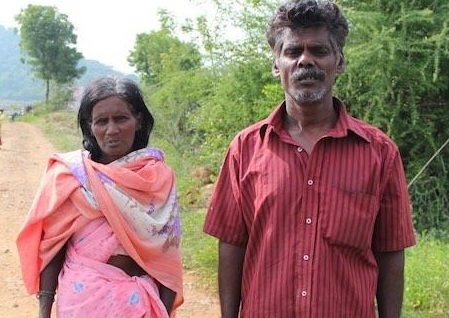 According to A. Kathir, executive director of Evidence, a movement that works on human rights among Dalits, Rajalakshmi and her mother Chinnaponnu were stringing flowers together when Dinesh Kumar arrived with a sickle. He abused them by targeting their caste, and beheaded Rajalakshmi, in spite of Chinnaponnu’s intervention. Thereafter, he took Rajalakshmi’s head and went home, where his wife Sarada advised him to discard it elsewhere. Subsequently, they went to the police station together where Sarada claimed that her husband was mentally ill. However, the police have dismissed claims that Dinesh was suffering from mental health problems when he slaughtered the minor and maintain that he is physically and mentally sound. Rajalakshmi was beheaded for speaking about her # MeToo incident. She was killed because she had the audacity to reject the sexual advances of an upper caste man and for speaking out. It is deeply shocking that a heinous crime such as this has evoked so little media attention even while the # MeToo Movement in India has captured the nation’s imagination and is garnering so much support. Given this context, the stoic silence from a large section of civil society, political class, child rights organizations, local and national media to the gruesome killing of a minor dalit girl is extremely disturbing. It is tragic that the sexual harassment faced by the minor and her brutal beheading by an upper caste man has not shaken the conscience of the country. Rajalakshmi’s killing brings to the fore the heightened vulnerability that Dalit girls and women face on a routine basis. Vulnerably positioned at the bottom of caste, class and gender hierarchies, Dalit women and girls continue to experience endemic gender-and-caste discrimination and violence including sexual violence as the outcome of severely imbalanced social, economic and political power equations. Their socio-economic vulnerability and lack of political voice, combined with the dominant risk factors of being Dalit and female, increase their exposure to potentially violent situations. Moreover, attempts by Dalit women/girls to protest or resist sexual harassment and assault by upper caste men have often led to brutal outcomes as witnessed in Rajalakshmi’s case. 1. The Government of Tamil Nadu provides the victim’s family protection in the wake of caste tensions and hostilities that may arise as a fall out of the brutal murder. Without proper protection, the family may flee the village in the face of threats and harassment from the accused and others in the village as is often the case. 2. The Government of Tamil Nadu provide the family the legal and financial support to fight the case till the cause of justice is served. 3. The Government of Tamil Nadu arranges for necessary counselling and psychosocial services for the family to deal with their deep personal loss and trauma. 4. The case should be tried under the POCSO Act in addition to other relevant Acts and IPC provisions as Rajalakshmi was a minor. 6. The Central and State Government must walk the talk with regards to their commitment to uphold the safety, dignity and integrity of women and girls, especially those from marginalized backgrounds such as Dalits, Adivasis and minorities by immediately setting up mechanisms/projects for the safety and security of women and girls through the Nirbhaya Fund, administered by Department of Economic Affairs, Ministry of Finance. 7. The Central Government develops a nationwide scheme for witness protection outside the courtrooms. Lack of victim and witness protection acts as a significant barrier to obtain justice. It deters victims from cooperating with investigations and testifying in court, and makes it more likely they will turn “hostile” and retract earlier statements, contributing to unwarranted acquittals. Girls and women who report sexual violence are often even more vulnerable and face extreme pressure or direct threats from the accused. This was unanimously conveyed by over 1000 delegates from 200 organisations who gathered from all over India at the three day Peoples’ Convention on Infrastructure Financing, organised in the backdrop of the forthcoming AIIB Annual General Body meeting hosted by India in Mumbai. 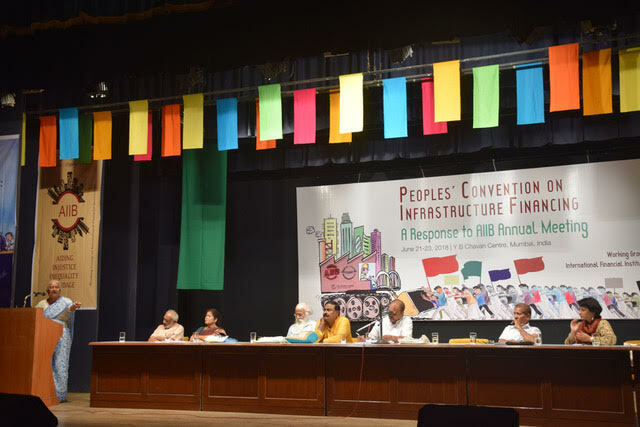 The Convention debated, discussed and challenged in 20 parallel workshops, the functioning of the international financial institutions and complicity of the Indian ruling and political class in pushing big and unnecessary hyper inflated infrastructure projects like industrial corridors, bharatmala, sagarmala, bullet trains, smart cities and others. In the political resolution adopted at the end of the Convention delegates resolved to challenge the undemocratic and economically unsound functioning of IFIs including AIIB, World Bank, IFC and others. The Convention also resolved to push for people-centered alternatives in all sectors of the economy, and to advance an inclusive model of development in which finance and infrastructure support the vulnerable and the poor communities, instead of supporting primitive accumulation of natural resources and maximising the profits of the multinational corporations and global elite further contributing to the increased inequality in the society. Delegates vowed to return to their communities to build massive resistance to the ongoing destruction of the environment and livelihoods of the poor and the working classes, and to work to create decent jobs, promote sustainable farming, equitable access to public services, advancement of the entrepreneurial skills of artisanal and natural resource dependent communities, and of labour-intensive small and medium enterprises. The Convention reasserted its belief in democratic decision-making and the advancement of cooperative federalism as a method of resisting the prevailing hegemony of undemocratic and unaccountable financial institutions such as the AIIB. Speaking to the media, prominent activist and Goldman Environment Awardee Prafulla Samantra said,“The Peoples’ Convention is further strengthening our strategies and vision to oppose and reject international finance which does not confine to the democratic principles and causing immense and irreversible damage to people, depriving of their livelihood and snatching away their resources and causing damage to environment, accelerating climate change”. The three-day convention was attended by different trade unions, networks of hawkers, fishworkers, slum dwellers, adivasis, dalits, farmers organisations and peoples movements. 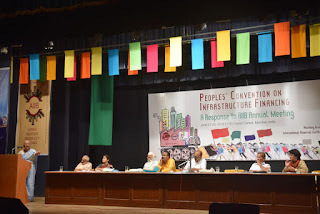 The convention was attended by senior activists, academics and financial analysists including Medha Patkar, economist Prof. Arun Kumar, financial analyst Sucheta Dalal, activists Ulka Mahajan, Com. Roma, Shaktiman Ghosh, Leo Colaco, T Peter, Dr Sunilam, Ram Wangkheirakpam, Leo Saldanha, Rajendra Ravi, Gabriele Dietrich, Surekha Dalvi, Sanjay M G, Ashok Chaudhary, Gautam Bandopadhyay, Bharat Patel, Jesu Rethinam, Seshagiri Rao, Meera Sanghamitra, Maglin Philomin, Soumya Dutta, Awadhesh Kumar, Umesh Nazir, Raju Bhise, Prof H.M. Deserda and many others. “Financial institutions have declared a war on people, land, water and coasts. Workers rights are sacrificed at the altar of development. We are left with no option than to reject and oppose this onslaught by the financial institutions, both national and international” said Jesu Rethinam of National Fishworkers Forum. Asian Infrastructure Investment Bank, the two-year-old multilateral bank, is investing in all major sectors, including energy, without robust policies on environmental-social safeguards, transparent public disclosure and an accountability/complaint handling mechanism. Out of the total 24 projects, it has financed, USD 4.4 billion has already been approved. India is the biggest recipient from AIIB with more than 1.2 billion USD supporting about six projects including Transmission lines, Capital City Development at Amravati, rural roads etc. with another 1 billion USD in proposed projects. About Us: WGonIFIs, a network of movements, organisations and individuals to critically look at and evaluate the policies, programmes and investments of various International Finance Institutions (IFIs), and joining the celebration of the people and communities across the world in resisting them. A list of the network is available here. Last year, when the Asian Development Bank completed 50 years, the WGonIFIs observed it by holding actions of protests in over 140 locations spread in over 21 states in India against the investment policies of ADB and other International Financial Institutions. Bhumi Adhikar Andolan against the Assault on Cattle Economy and Lynching of Dalits and Minorities. |New Delhi| April 3rd 2018 marks one entire year since Pehlu Khan’s death, a dairy farmer from Nooh district of Haryana who was attacked by a group of 200 cow vigilantes affiliated with right-wing Hindutva groups in Alwar, Rajasthan. It is shameful to see that the Rajasthan govt. has still not made the case a priority - to deliver justice to the victims or address the increasing cases of cow vigilantism. There is a growing threat to the power of democratically elected state-government and courts from quasi militant groups such as the gau-rakshaks, who have undermined the Right to Life of individuals and communities, especially in the rural agrarian belt. Various militant and political outfits such as RSS and VHP have regularly attacked cattle traders under the guise of “gauraksha” (cow protection). Pehlu Khan’s family is still struggling to come to terms with their loss and live a normal life. The delay in this case clearly shows not a lack of evidence, but a lack of will to bring the killers to justice. The role of the local police officials in the subduing and diluting of the cases, including threatening families and friends of the victims of filing false cases, destroying evidence and adopting a strategy of false encounters must also be looked into. Com. Hannan Mollah stated that since Pehlu Khan’s lynching, over 300 more cases have been reported, the victims were dairy farmers, dalit and Muslim cattle traders, and none of them have received justice even now. It is time for the nation to agitate against such politically motivated murders; as a democracy, India cannot standby as innocent farmers, traders and other social minorities are murdered in broad daylight. Bhumi Adhikar Andolan continues its demand for justice for these victims, for immediate relief to be provided to the families of the victims of these attacks and strives to provide support to the families of the victims. It also condemns the protection given to these gau-rakshaks who have run havoc across the country, and are visibly operating with the patronage of local and state administration and political groups who have vested interests. Com NK Shukla stated that these repeated attacks on cattle traders and dairy farmers are part of a bigger design to undermine the dairy sector of the country. He further added that these attacks are creating havoc on the lives of the farmers who are already distressed because they are not getting a fair MSP, they are burdened by debts and being pushed to commit suicides. Maulana Hanif also said that the repeated attacks on the Muslim community in Mewat is a result of a larger political propaganda, he stated that the need of the hour is for all the communities in Mewat to unite and stand as a strong front against such communal forces. 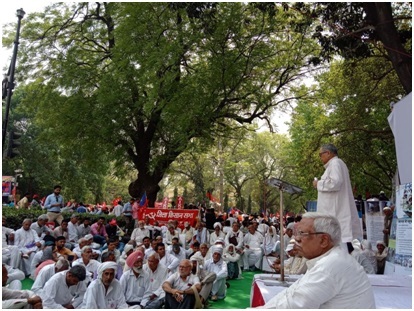 At the protest organized on 3rd April, 2018 at Parliament Street in Delhi, leaders of the Bhumi Adhikar Andolan called for nation-wide struggle against increasing cases of violence meted by right-wing groups in the name of cow-protection and of vendetta against all progressive movements and of continued attacks on dalits and minorities. National Alliance for People’s Movements (NAPM), All India Union of Forest Working People (AIUFWP), All India Kisan Sabha (Ajay Bhawan), All India Kisan Sabha (36, Canning Lane), Akhil Bhartiya Kisan Khet Mazdoor Sangathan, Lok Sangharsh Morcha, Jan Sangharsh Samanvaya Samiti, Chhatisgarh Bachao Aandolan, All India Kisan Maha Sabha, All India Agricultural Workers Union, Kisan Sangharsh Samiti, Sanyukt Kisan Sangharsh Samilti, INSAF, Delhi Solidarity Group, Kisan Manch, Bhartiya Kisan Union Arajnitik Asli, Mines Minerals and Peoples, Jan Adhikar Jan Ekta Andolan and Others. PARIS, 5 January 2018 (FIDH & VCHR): Vietnam’s unprecedented repression of dissent during 2017 calls for the international community’s renewed engagement with Hanoi on human rights, FIDH and its member organization Vietnam Committee on Human Rights (VCHR) said today. “The fact that the EU and the US are more interested in signing business deals than talking about human rights has emboldened Hanoi to harden its attacks on basic civil and political rights. It’s time for the international community to vigorously re-engage with Hanoi on human rights,” said FIDH Secretary-General Debbie Stothard. In 2017, Vietnamese authorities arbitrarily detained or imprisoned at least 46 activists and human rights defenders, including 7 women, for exercising their rights to freedom of expression and freedom of peaceful assembly. The crackdown accelerated in late December 2017, when 15 activists were sentenced to prison terms. “Vietnam’s accelerated repression at the end of December was strategically timed to coincide with the distractions provided by the end-of-year holidays. The EU and the US should open their eyes and raise their voices to demand the immediate release of all political prisoners and the speedy implementation of much-needed institutional and legislative reforms in Vietnam,” said VCHR President Vo Van Ai. On 20 December 2017, police and security forces in Ho Chi Minh City beat at least 20 people and detained five of them for participating in a peaceful protest against the Taiwanese-owned company Formosa, which was responsible for a massive environmental catastrophe in Vietnam’s three coastal provinces in 2016. On 21 December 2017, a court in An Giang Province sentenced five people under Article 88 of the Criminal Code (‘spreading propaganda against the state’) for hanging 26 flags emblazoned with three red stripes (the flag of the former Republic of Vietnam, also known as South Vietnam before 1975) in the province’s Chau Doc Township on 25 April 2017. 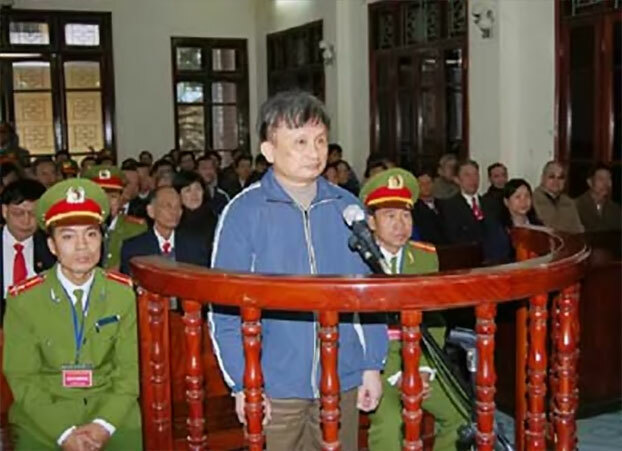 Nguyen Tan An was sentenced to five years in prison; Huynh Thi Kim Quyen and Nguyen Ngoc Qui received four-year sentences; and Pham Van Trong and Nguyen Thanh Binh were jailed for three years. On 22 December 2017, a court in Ha Nam Province rejected an appeal by prominent human rights defender Tran Thi Nga against her conviction and nine-year prison sentence under Article 88 of the Criminal Code. The court upheld the lower court’s decision in a hearing from which authorities barred Nga’s family members and supporters. Outside the court, police and security forces took into custody nine activists who had gathered to show support for Tran Thi Nga. At least one of them was beaten by thugs before being arrested. On 24 December 2017, authorities arrested former political prisoner Doan Van Dien at his home in Lam Dong Province and detained him in the B5 detention center in Dong Nai Province. The reason for his arrest was not immediately known. On 28 December 2017, a court in Binh Dinh Province sentenced nine people to prison terms ranging from three to 14 years for printing and distributing leaflets. Pham Long Dai, Doan Thi Bich Thuy, Truong Thi Thu Hang, and Tran Thi Bich Ngoc were convicted Under Article 88 of the Criminal Code. 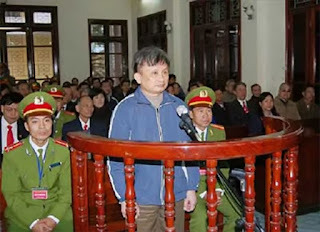 Ta Tan Loc, Nguyen Quang Thanh, Huynh Huu Dat, Nguyen Van Nghia, and Nguyen Van Tuan were convicted under Article 79 of the Criminal Code (‘conducting activities aimed at overthrowing the people’s administration’). In addition, all nine were sentenced to three years of house arrest to be served upon the completion of their prison terms. FIDH and VCHR are also troubled by the Vietnamese government’s latest move to tighten monitoring of internet content. On 25 December 2017, Deputy Head of the People’s Army Political Department Lt Gen Nguyen Trong Nghia announced that a new 10,000-strong military cyber unit, named ‘Force 47’, had begun operating “to fight proactively against the wrong views.” FIDH and VCHR reiterate their calls for the immediate and unconditional release of all political prisoners in Vietnam and for the repeal of all provisions of the Criminal Code that are inconsistent with the country’s obligations under international law. At least 130 political prisoners remain behind bars in jails across the country. Nearly all of those arbitrarily detained or imprisoned in 2017 were arrested and charged under Articles 79, 88, or 258 (‘abusing democratic freedoms to harm the interests of the state’) of the Criminal Code. It is a common refrain in the country that news has declined in content and quality. Social media is full of debate on the issue since innovations like the paid news and scandals like Radia tape. A common thread of concern is that the media is scandalizing, preaching and serving the masses a low comedy in the name of news than informing which is its primary task. How has this de-generation come about? In a democracy News opens up a reality to people on which they can act. The journalist’s task is to inform about that reality by presenting facts from more than one perspective so that people can form an opinion and choose their rulers. However, lately the news is being prevented from reaching the masses. This is done by stopping the journalist from gathering and presenting the news. The data compiled by Committee to Protect Journalists (CPJ) suggest that since 1992, 71 media persons have been killed in the country with hardly any punishment. A report by media watch website the hoot suggests that in 2010-16, 23 journalists have been murdered. There has been only one conviction in which an appeal is pending. Apparently, central and state governments are not protecting journalists and once harmed they government does not take interest in ensuring justice thus encouraging their purge. Ironically, journalist is merely a messenger going about his duty. Shooting the messenger was never so true than now. Furthermore, governments do not want news to reach the masses therefore using defamation laws against journalists. For example, during 2001-6 Jayalalitha government filed about 120 defamation cases against media. The DMK government that followed her was no less better filing over hundred defamation cases against the media and the present government recently arrested a cartoonist for highlighting plight of poor at the hands of money lenders in rural Tamil Nadu. Big business is another enemy of news and the journalist. Pranjoy Guha Thakurta had to resign from the editorship of the Economic and Political Weekly , under the threat of a legal suit. He has also received defamation notices from lawyers of Mukesh and Anil Ambani led Reliance industries after he self published Gas Wars: Crony Capitalism and the Ambanis. Corporate treat news as a commodity that can be made packaged and sold defining news upside down. On the contrary, news cannot be manufactured; news happens. The major task of corporate media is to suppress the news as it happens and replace it with manufactured commodity in that proportion and serve it to its audience that buy their other products too. Corporate control and regulate the flow of the news in the country now. Mukesh Ambani led Reliance group has taken over network eighteen group of companies and has invested about $ 6 billion in media sector. BCCL that runs Times group is already nearly 1.5 billion conglomerates thriving on its innovation of the paid news. Star news is controlled by Rupert Murdoch’s century fox that is fourth largest media house of the world and primary source of news for Donald Trump, who some suspect, is the ‘liar in chief’ of the modern times. With NDTV and Living Media, that broadcasts Aaj Tak and publish popular weekly India Today in several languages, also receiving significant corporate investments news gets sanitized off purity and sensitivity when it reaches television studios. It turns into a propaganda with an agenda. Thus, with radio news and Doordarshan (public television network reaching 596 million of 1.3 billion) under government and rest under corporate control, 16000 times rise in fortune of the son of the ruling party chief in a year is not a news. Instead, for private major TV news channels the exploits and wisdom of convicted and current babas, Karva Chauth, Shakahari Gurugram is the news. 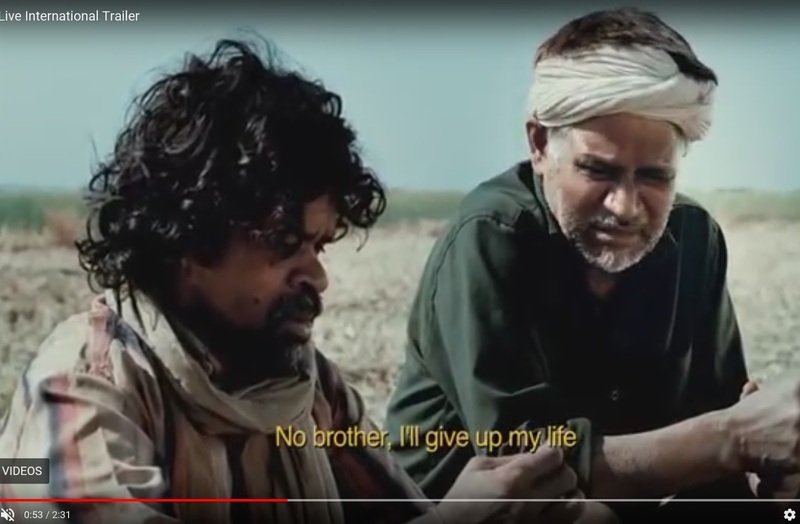 This media when tasked to cover social issue such as infants’ death in hospitals, or farmer’s suicide in rural India present a spectacle similar as shown in popular Hindi movie Peepli Live. Another disturbing trend in India is tendency to defame and fracture the media as an institution by its own ilk. This is borne out from the headlines like, ‘Amit Shah’s son to file 100 crore defamation suit against website’ in a prominent newspaper. The headline is disingenuous as it imputes that the news portal’s report is ambiguous and deserves a suit. This is a case of corporate media demeaning independent media. Journalism will live as long as passion to bring out truth remains and journalists will create new ways to survive. This optimism stems from testimony of a soldier like passion and courage of the journalist Rohini Singh who broke Jay Shah story. She was trolled and threatened by the paid social media mob not withstanding that she had previously reported on Robert Vadra’s accumulation of wealth under the congress regime. She wrote back , “My primary job is to speak truth to power. To question the government of the day”, adding, “I don't do the sort of stories I do because I am ' brave’. I do them because that's journalism”. So long the above spirit remains news will shine in debris of propaganda. This week Just Asia begins with the death of 60 Rohingya in a boat capsize off Bangladesh on September 28, as they were fleeing violence in Burma. A UN spokesman said 23 people were confirmed dead and 40 more were "missing and presumed drowned". Dozens of Rohingya have already died trying to cross into Bangladesh amid a military crackdown in Burma’s Rakhine state. Violence erupted in Rakhine on August 25 when Rohingya militants attacked security posts. More than half a million Rohingya have fled to Bangladesh since then. Just Asia speaks to Adhilur Rahman Khan, Secretary of Odhikar, regarding the situation of refugees in Bangladesh. Next, the UN Special Rapporteur on Cambodia said the government must do more to protect democratic freedoms in the run-up to 2018 national elections. In a report submitted to the UN Human Rights Council in Geneva, Rhona Smith said, “deterioration of the democratic space and freedom of expression in Cambodia is a primary concern, with many NGOs and human rights defenders subject to threats, harassment, arrest”. Opposition leader Kem Sokha was arrested without a warrant in Phnom Penh on September 3 and accused of trying to topple the government with backing from Washington. He faces up to 30 years in prison if convicted. In preparation for the 20th anniversary of the 1998 Asian Human Rights Charter, rights groups and activists are discussing how to move forward and ensure the genuine realization of people’s rights in Asia. The 1998 Charter was aimed at changing how human rights work was conducted in developing countries. In particular, the aim was to understand and improve the defective institutions and systems of justice required for human rights implementation. Just Asia speaks to Basil Fernando, AHRC’s Director for Policy and Programme Development for details. Moving to Indonesia, the country is seeing a rise in anti-Communist phobia and rhetoric, with a massive protest in Jakarta on September 29. Held by anti-Communist groups and opposition supporters against the Communist ideology, the protest was termed 29-9. The protest followed the brutal attack on the offices of the Indonesian Legal Aid Foundation (YLBHI) and Jakarta Legal Aid between 16 and 17 September 2017. These circumstances are weakening the efforts of victims and families of the 1965-1966 massacre to seek justice. They now face increased difficulties and obstacles to voice their hopes and desires. Finally, the Urgent Appeals Weekly features three cases from Nepal and Sri Lanka.